I'm not a big 'socks' person due to my lifelong fear of wearing trousers (I really hate the way I look in trousers and nearly always wear a dress. Fact). (In my day to day life that is. Obviously I don't run in dresses). 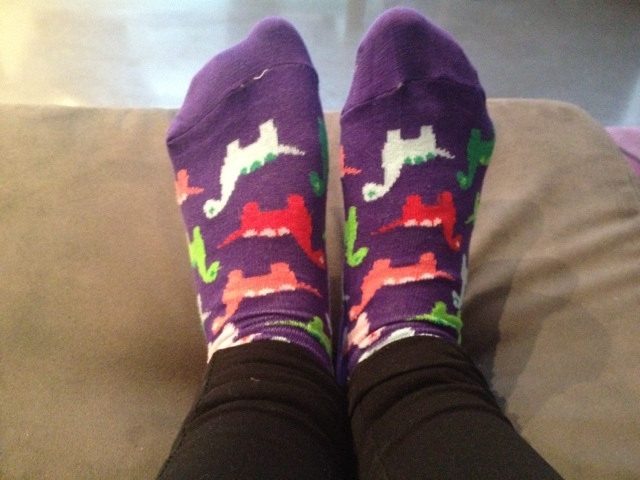 But I saw loads of cute socks £1.99 for 3 in Primark and I thought it might cheer me up when getting ready to exercise. It did! Ever since my Grandad had to pick me up from running last week when I thought I was going to faint my family have been insistent that I always take water when running. I thought I would buy a bottle just for the purpose. 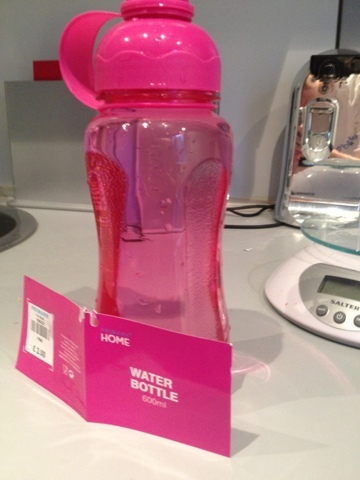 Hot pink and easy to carry, it does the job it says on the tin. To say my run today was during a heavy shower is an understatement; this rain was truly BIBLICAL, I was totally drenched, people with umbrellas were looking at me like I was mad. But you know, it wasn't all bad, it kept me cool and incentivised me to run a bit faster... I think I do need to get myself some wet weather running gear ready for autumn though! I have an iPhone 4 and I use it for both GPS and music when I run (and emergency phone calls to grandparent to save me but there you go). Today as it was extremely heavy rain I didn't want to break my phone so whipped out a running armband to keep it dry. This worked fine but the only problem was it messed with my speed stats a bit as I couldn't easily pause the run when at traffic lights, but we live and learn. 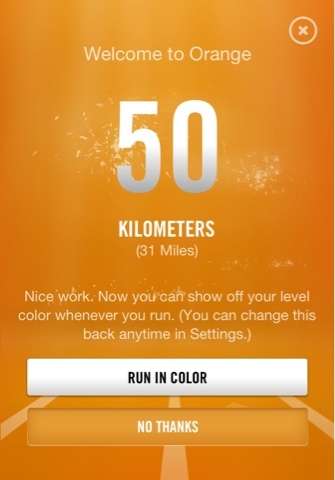 I've not been using the Nike app for that long so was thrilled to get to the 'orange' level today! I only ran 2 miles as I'm only taking it slow but now I'm at a higher level I feel more like a proper runner! I love the Nike app and will write about it at length soon. After my worries that the pox had destroyed my running forever, I'm feeling back on track again and I'm within the routine of running every other day. I'm still going crazy short distances but my new philosophy is that every time it feels easy, the next run I increase 0.25 miles. It's going well so far. I just want to get back up to being easily able to knock out a 5k before my holiday so in September I can really get started on training for a 10k. The best thing is I'm loving it again, look forward to my runs and feel great about them afterwards. I never knew exercise could be something I enjoyed until I started running. I know it feels like all I chat is running recently but I'm planning on starting joining in on #WIAW (What I Ate Wednesday) so keep your eyes peeled for some food-type posts!